July | 2011 | WHAT A FEELING! The only interesting thing about Cyborg is that it represents another step in the career of one Jean-Claude Van Damme. Van Damme is trying to make the leap from European body building champion to American movie star. It has been done before, and Arnold Schwarzengger’s lessons are there for all to study. Van Damme has learned well. Like Schwarzenegger, he knows not to talk much (Belgian-born, his accent is about as thick as his biceps) and to do a lot of scenes with his shirt off. He has the body and he has the looks, although he doesn’t seem blessed with Schwarzenegger’s droll sense of humor. In fact, he doesn’t display much sense of anything, except how to move. His martial-arts skills came in handy in his first starring vehicle, Bloodsport, a karate-chopping extravaganza that did strong business internationally. Now comes Cyborg, a trip into the science-fiction landscape of The Terminator and The Road Warrior. The script (by Kitty Chalmers) is pretty much incoherent. The earth, some years in the future, has been devastated by a plague, but a cure is held in the brain circuits of a cyborg, a robot. This cyborg must reach, of all places, Atlanta, where a small group of scientists is waiting to secure the data. Times are tough for a traveling cyborg, because a group of marauders called the Flesh Pirates are roaming around asserting their nasty will. So Van Damme, a sort of roving samurai, makes sure the cyborg reaches Atlanta. Director Albert Pyun obviously has been inspired by Kurosawa’s action movies, and there’s some decently mounted hand-to-hand fighting and a violent climactic battle in the rain. 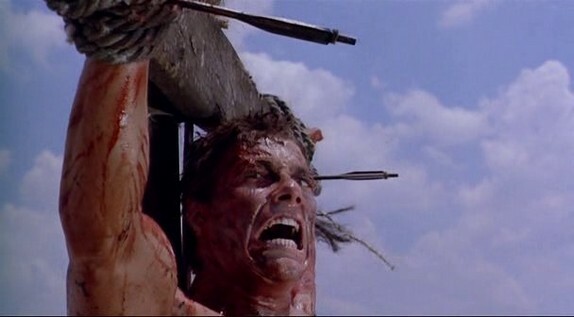 There’s also a wild and weird crucifixion scene in which Van Damme painfully knocks himself off the cross when the bad guys aren’t looking. Ouch. Otherwise, Van Damme glowers, and manages lines like, “I deedn’t make thees world.” I have to admit that when he and the main villain (Vincent Klyn, a champion surfer) faced off, they reminded me of Hans and Franz, the Germanic body building brothers on “Saturday Night Live,” flexing and bellowing. But don’t tell Van Damme I said that; his muscles aren’t cotton stuffed in a sweat shirt, they’re real. To be fair, maybe the cyborg is going to Atlanta because the Center for Disease Control is there. And they’d be smart enough to have built a secure plague-resistant HQ, for sure. So I take that comment back, and regret the umpteenth iteration of the “accent thick as muscles” line, too. Frankly this movie sounds like fun, especially the part about JCVD knocking himself off the cross in mid-crucifixion. For more on the cinema of Albert Pyun, check the review of Dangerously Close and the comments section. For a few years, Michael Mann was one of the more interesting directors, with his TV film The Jericho Mile, the high-tech James Caan movie Thief, and the exceedingly weird sci-fi World War II picture, The Keep. Mann looked like one of those original talents who have to scratch and claw for every idiosyncratic project. Then he stumbled onto a television show about some “MTV cops,” titled “Miami Vice.” As executive producer, he’s the chief creative force on that very successful show. Now, having garnered some clout, he’s flexing his muscles. The movie that puts him back in the director’s chair, Red Dragon, will be released later this year. First out is another Miami production on which Mann serves as executive producer, Band of the Hand; the directing chores are handled by a “Vice” collaborator, Paul Michael Glaser. Glaser’s visual style follows the “Vice” look pretty closely (aided by the increasingly active Risky Business cinematographer, Reynaldo Villalobos); the streets and alleys of Miami are dotted with pink and turquoise, the nights shine with neon, the bad guys glisten with evil. But the most effective scenes in the film take place in the Everglades, where, in the opening minutes, a racially balanced quintet of violent and seemingly incorrigible juvenile convicts is unloaded. They haven’t been told why, they don’t know where they are, and they don’t want to be there. A mysterious figure appears: a tough commander (Stephen Lang) who barks orders to them but doesn’t spell out why they’re in the Everglades. He does tell them that they’ll have to learn to survive with the elements—and with each other—or he’ll let them die out there. Lang takes them through a rough regimen of survival skills, in sometimes compelling sequences. It turns out he’s training them as part of a rehabilitation service. When they return to Miami, he’s going to have them work together as a positive force within the decaying inner city. Unfortunately, once they get back to town, the film becomes as interesting as a subpar episode of “Miami Vice,” but without the black Ferraris. Glaser has trouble with the film’s structure; it goes on for about a half hour after you expect it to end. And for all of Glaser’s experience on the “Vice” squad, he makes a basic mistake: Too much of Band of the Hand takes place in dull daylight, when the flashy nighttime scenes are what make the TV vision of Miami tick. The five hooligans are not bad, and Lang, who was superb as Happy in the Dustin Hoffman Death of a Salesman, is effective as the strong-but-silent leader. And, as usual, James Remar is adept at playing the kind of big-time psychopath he essayed so well in The Cotton Club and 48 HRS. But the film is never again as engaging as the early Everglades scenes. Its attempt to provide a showy conclusion by blowing everything up at the end feels desperate. And the Bob Dylan title tune, heard a couple of times, actually creates a more vivid picture of the urban inferno than anything in this movie. Michael Mann would come roaring back in movies, as you know, and “Miami Vice” did a quick quality-swoon after its first season. 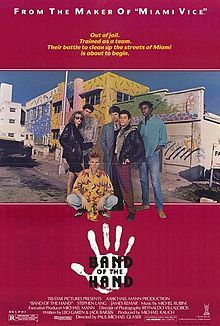 Larry Fishburne and John Cameron Mitchell are also in Band of the Hand, plus a scad of 80s hits; I take it the movie’s a camp classic now, and clearly I was a little too respectful in this review; ordinarily when I write a sentence like, “he’s going to have them work together as a positive force within the decaying inner city,” I can provide some kind of smirky paranthetical. For a guy who scored a major independent success with his first film, She’s Gotta Have It, Spike Lee had a devil of a time getting his follow-up feature made. School Daze was canceled during preproduction by Island Pictures, the company that distributed She’s Gotta Have It. Happily, Columbia Pictures immediately picked up the project. But Lee’s problems were not over. Halfway through filming, he was barred from shooting at the black campuses (including his alma mater, Morehouse) where the film is set. Evidently the school administrators felt that Lee’s comic-dramatic-musical remembrance of his days at a Southern black college was giving a negative image to black education in general. Lee had to scramble to find alternate locations. Even with the film successfully completed, Lee must now fight the sophomore jinx. There are inevitable expectations when a moviemaker hits it big the first time out; as though to head off those kinds of expectations, Lee has made a very different (and much more ambitious) sort of film. School Daze touches on a number of complicated issues in tracking the activities of a passel of students over a weekend at mythical Mission College. At the heart of the matter is the split between two classes of students. The light-skinned black students join fraternities and sororities and wear blue contact lenses. The dark-skinned blacks are contemptuous of them, and more defiant in their attitudes. Out of this ensemble piece come a handful of different stories: the efforts of a pledge, Half-Pint (played by Spike Lee himself) to join the elite Gamma Phi Gamma fraternity, and survive a variety of hazing humiliations; the protests led by Dap (Larry Fishburne) to make the school divest its holding in South Africa; Dap’s touchy relationship with his girlfriend (Kyme), who wants to pledge a sorority. There’s a lot going on in this film, including moments of surrealism such as the ending, addressed directly to the audience. Enough going on to invite justifiable charges of unevenness; this is recognizably the film of a young sensibility, of an impertinent, free-swinging instigator. But for a young film, School Daze shows considerable complexity. The characters, despite their physical differences, are not easily divided into the goods and the bads. Spike Lee has a way to go before he becomes “the black Woody Allen,” as some critics have irrelevantly dubbed him. But School Daze is a gutsy step in the right direction. For my money Lee took quite a few steps in wrong directions as the years went by, but there was still a certain fizzy youthfulness to this movie that excused the director’s clumsier tendencies. The suggestion that Spike Lee does not divide his characters “into the goods and bads” comes as some surprise to the present-day me, especially given the films that have come since 1988, and it’s pretty clear which side he favors in this movie, but he does make some effort to cloud the waters. Finally, the sheer brio of the movie’s approach takes the day, to say nothing of the satisfaction of seeing a film about an African-American institutional system made from the inside out, rather than the other way around. Hilll’s problem may have ben solved in the casting of the role, for these days almost anything with Arnold Schwarzenegger is automatically ticketed for public acceptance. 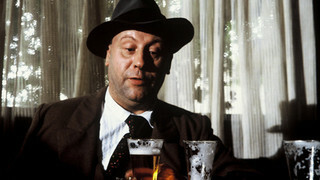 The Soviet hero of Red Heat is a Moscow policeman who comes to Chicago in search of a lethal Russian criminal. There he gains the prickly comradeship of a Chicago cop (James Belushi) on the trail of the same man. The cop-buddy movie is a familiar formula, but Hill consistently finds a way to put a distinctive spin on individual scenes. He begins the film in the Soviet Union with a crisply mounted manhunt, wherein Schwarzenegger pursues his quarry through a coed steambath, a fistfight in the snow, and a seedy Russian bar, where the pursuit climaxes in one of the truly outrageous physical punchlines of recent memory. This is topped by Schwarzenegger’s deadpan announcement after he ditches his uniform and dons an ill-fitting blue suit: “I am working undercover.” He still looks every inch (and there are a lot of them, of course) the alien. Though Red Heat is fundamentally lightweight, and its narrative locomotion occasionally threaten to outstrip the niceties of logic, it is always informed by wit. It’s a return to cruising speed for Hill, whose recent outings have included the curious byways of Brewster’s Millions, Crossroads, and Extreme Prejudice. Hill says the genesis of Red Heat was his desire to direct Schwarzenegger, which brings some built-in problems. “He’s a little hard to make work, the accent and all. 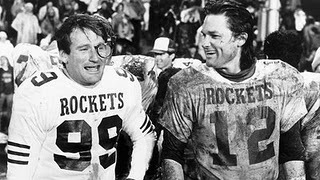 He can’t play from Peoria, or somewhere.” So Hill came up with the Soviet angle, and “We really wrote the script after we had the actors, which is unusual. The iconography of actors is critical,” he says. Hill has heard Red Heat compared to his biggest hit, 48 HRS. “It resembles 48 HRS. a lot less than a bunch of other movies made in the last three years. 48 HRS. 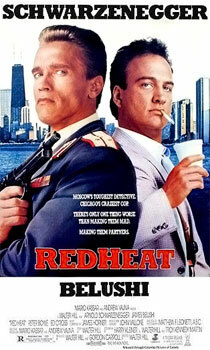 was a very funny movie, as long as you didn’t think it was a comedy.” Exactly the same is true of Red Heat. What I make of Hill’s movies is that they continue to represent one of the most provocative talents in the American cinema. My favorite Hill film is The Long Riders, arguably the best Western in the lean two decades after The Wild Bunch. I interviewed Hill in a busy restaurant, but I can’t remember which one. He wore sunglasses during the interview, which a publicist explained had to do with his sensitivity to light. I probably told him I had a poster for The Long Riders hanging in my room. As for Red Heat, I seem to have enjoyed it, although the specifics have gotten hazy and the exchange, “Danko” “You’re welcome,” makes me question my standards. Back in 1979, an apparently crazed 25-year-old writer-director named Don Coscarelli came out with a weird little horror movie called Phantasm. It was a jumble of imaginative effects, and turned into something of a sleeper, both commercially and critically. Coscarelli seemed to be a filmmaker to keep an eye on, but he hasn’t done much since Phantasm (his most high-profile project was The Beastmaster). So it is natural that he would return to what he knows best, and Phantasm II is the inevitable result. There’s a cursory flashback at the beginning of the new film, for those who missed the original. It doesn’t really provide any helpful information, but then storytelling is not Coscarelli’s strong suit, and Phantasm II doesn’t make very much sense in any case. The main thing here is that the special effects and grotesque imagery are in hyperdrive by the end of the movie. The hero from the first film is grown up now, but still haunted. Mike (played by James Le Gros) has visions, and his visions tell him that bodies are being stolen from graves. When he bumps into his old friend Reggie (Reggie Bannister) in a cemetery, Mike is raving: “Doesn’t it strike you strange, Reg, that every single corpse in this entire graveyard is missing?” Indeed it should. The dead are being recruited into an army of hunched creatures who scuttle around in monk’s robes and perform nasty deeds. The two men hit the road to track down the ringleader of all this evil. It is, of course, the villain from the original Phantasm, that ominous mortician (or is that a redundancy?) known only as “The Tall Man,” played here, as before, by a cadaverous actor named Angus Scrimm. Even his name is scary. This sets the stage for the really gruesome finale. Coscarelli combines the fearsome physiognomy of the Tall Man with the deadliness of these flying silver balls, which lock themselves onto their victims’ foreheads and make like dentist’s drills. Ouch. The movie has some startling sequences, but it’s too rangy and disjointed to sustain itself. You can say this for Coscarelli, though: He knows how to put the screws on. I’m pretty sure I missed the remaining films in the Phantasm saga, although fond memories of seeing the first one in a drive-in theater remain. Coscarelli’s Bubba Ho-Tep has enough pretty wonderful moments to make you wonder why this guy doesn’t make more movies. You are currently browsing the WHAT A FEELING! blog archives for July, 2011.